"Everybody get on your feet!" It is a call to action – less of a command and more of a motivational plea. It is an encouragement to get on the dance floor and in doing so, to be bold, to take chances, and to make the most of each moment. Admirable as it is, however, such a call makes one innocent but very important assumption: it assumes the listener can get on their feet. When Lauren Arena was ten years old she began to experience seizures along with an involuntary twitching sensation in her hands and arms. Despite numerous consultations and testings, no diagnosis could be made as to why. The situation worsened. The muscle spasms progressed to her legs and torso. She was eventually bound to a wheelchair. More testing. No results. Her speech began to be affected. Finally, Lauren’s situation led her to take part in a study conducted by scientists from around the globe. In November of 2014, she was diagnosed with a condition known as MEAK. As Lauren’s mother Angela so aptly mentions, the name MEAK (a homonym for the adjective describing a quiet and gentle nature) is nothing short of ironic. After all, there is nothing “gentle” about Lauren’s condition. MEAK causes myoclonic epileptic seizures (ME) and ataxia (A) in the body as a result of a mutation in the protein coding gene KCNC1, which mediates potassium (K) ion channels that are key components for body movement. The seizures are highly disruptive and often inhibit MEAK sufferers from doing the most common day to day tasks. The disease is also exceedingly rare. To date, there are only twenty people in the world who have MEAK, and only one case has been found in the United States: Lauren. As one might expect, since there is so little research on MEAK at this time, doctors have yet to discover a cure. So, Lauren continues to be bound to her wheelchair and continues to experience myoclonic seizures. But that is far from all she is doing! In 2013, Lauren joined the Roll Call Wheelchair Dance program headed by renowned coach, and long-time Dance With Me friend, Mr. John Nymchek. It did not take long for Lauren to realize that she had found a therapy for her condition, even if science had yet to find a cure. Her love of dance eventually led her to continue her training at Dance With Me studios with her new instructor, David Dowding. "Lauren, I've never once looked at her as a person in a wheelchair.... I say 'you're no different than anybody else... You wanna dance? That's something that you're passionate about? Great! We're gonna do it to the max!'" 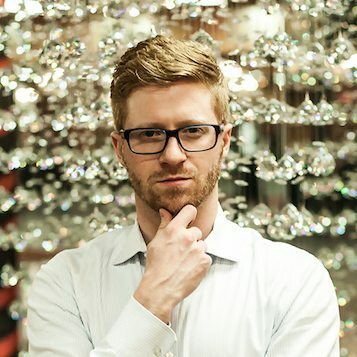 David has made good on his promise. In her time since she began at Dance With Me, Lauren has progressed from social dancing, to solo performances (that rarely leave a dry eye in the house), and most recently, to dancing in her first ever competition. *Writer’s Note: I had the good fortune of being a judge for Lauren’s first competitive dances. If you are picturing a simple performance that is more a moral victory of sorts, think again! Lauren’s routines are well choreographed (not by me) and well rehearsed! From her hair, to her dress, to her arm styling, Lauren takes her dancing very seriously, and we would all do well to mimic her dedication to her craft. What is next for Lauren? More dancing of course! With each performance she strives to hone her technique, challenge herself, and enjoy the renewed sense of joy, community, and purpose dance has given to her. She wants to bring awareness to MEAK, but she does not want to be defined by it. "Dance really helps me... I can't say it enough how supportive everyone is. I was nervous that they were going to see me as someone in a wheelchair. Now, they don't even see the wheelchair. They just see me, and that's what I love." There is only one person in the United States who has been diagnosed with MEAK, and she…is a dancer. 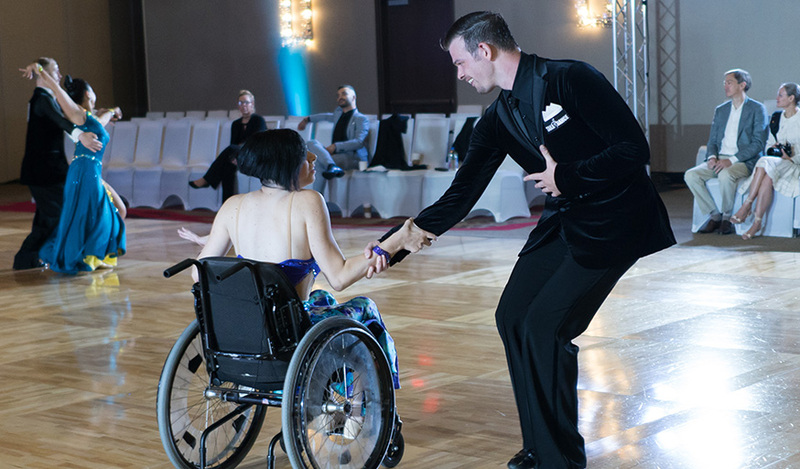 Post Script: At her most recent competition, Lauren danced a bachata with her instructor, David – not from her wheelchair, but standing. When the call came from the emcee for everyone to get on their feet, Lauren was there. 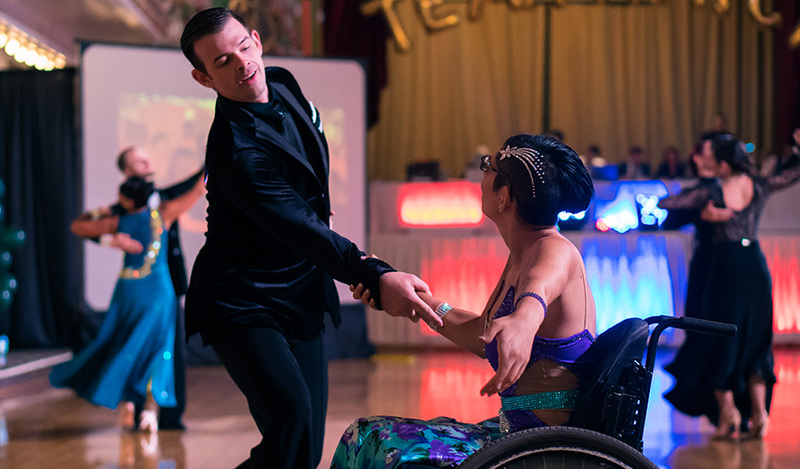 Click here to see Dance With Me’s wheelchair dance program.